Today I have a very pink card for you. It seems appropriate as it's October and Breast Cancer Awareness month. If you haven't checked your breast yet, stop reading right now and go and do it. It is very important to get anything suspicious checked out right away. I had a scare last year and it was horrible waiting for the test results so I get it's scary. I was one of the lucky ones and got an all-clear. Not everyone is so lucky but key is early detection so go have a thorough check-up. If you aren't sure what to look for or how to do it, there are several breast cancer websites that will show you. Right, now I have been quite bossy enough, I'll get down to the crafty side of things. I used the gorgeous Splendid Roses stamp again, it's just so stunning I couldn't help myself. I coloured it in with Copics, using soft pinks for the petals and greens for the leaves. Once I finished colouring, I fussy cut the image. For the actual background I decided on using a polka dot patterned paper from a Lawn Fawn pad. To frame the card, I also cut a stitched rectangle in white linen paper using Lawn Fawn dies again (I'm slightly obsessed with them) I stamped a sentiment in pink ink on a banner cut out of kraft paper to keep the look soft. 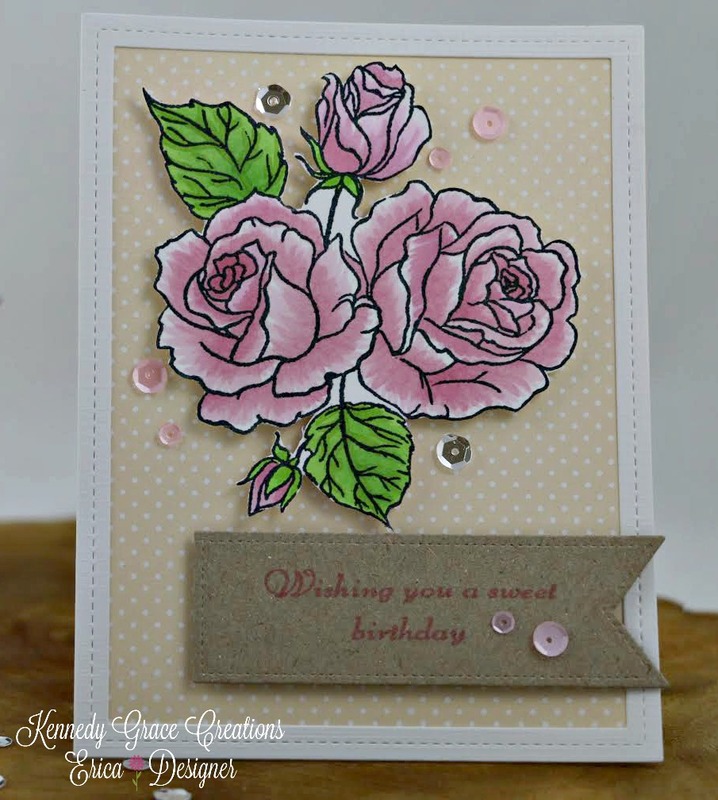 The roses that I fussy cut out earlier was adhered to the card panel using 3mm thick foam tape to create dimension. To create another layer, I added the banner using 2mm thick foam tape. For some finishing touches, I used some sequins from the Pink Champagne and Moonbeam mixes. That's it from me today, I'm not my usual rambling self as I'm not very well at the moment *sniff sniff, cough cough* I'll make it up to you next time with lots of jibber-jabber.